The price that we pay as a customer to have a letter or a package delivered is referred to as the postage and the money that you pay is to the US Postal service (USPS). To know whether the postage required has been paid or not, several indicia is used with the postage stamps being the most common of them. 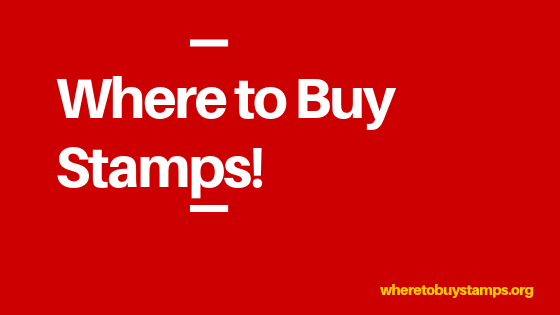 So here is the ultimate guide for where to buy stamps in and around your place. 1 Where to Buy Stamps? 2 Why You Need a Postage Stamp? 26.1 1. How many types of postal stamps are available with USPS? 26.2 2. How to make stamp selection out of varied options? 26.3 3. How to purchase stamp online? 26.4 4. What are featured stamps? 26.5 5. What is stamp subscription? 26.6 6. What are the current postage stamp rates? The stamps of US are published by the United States Postal Service (USPS) within the country and the amount you pay for the stamps go to USPS. Semipostal stamps are generally issued to provide funding to a cause like that of breast cancer. A portion of the proceeds received from selling these stamps are given to the cause it was issued for. Commemorative stamps are to commemorate an event or a person and are generally run limitedly for one year only. These are mostly a collectors’ item and not used much as postage, even though they are valid postage stamps. Forever stamps were first issued in the year 2007. The stamps are forever because even if the postage prices increase, you can use the old stamp to mail your letters. There is no need to get additional postage. Definitive stamps are issued every year in the denominations between 2 cents to $5. They have different images from animals, birds to famous personalities like George Washington, from Liberty Bell to Tiffany lamp. Why You Need a Postage Stamp? As we mentioned above, postage stamps are the charges you pay to get your package or letter delivered to the recipient. The payment of postage is done through multiple means with the main one through stamps. It is the evidence that you have paid for the postage. But that is not all postage stamps are for. A postage stamp is generally made on custom printed stationery and it shows the denomination that is the value of the stamp and the country it originates from. They are generally self adhesive or can be stuck easily onto the mail. It is advised that the stamps are stuck onto the upper right hand corner for better processing at the postal service. Here are more reasons on why you need a postage stamp. Every stamp is different for every country and the postage stamp clearly indicates where the letter or the package is from. You do not have to visit the postal services office for sending a letter when you are using postage stamps. You can instead get the stamps from the multiple outlets or print from online. What you pay for the postage stamp is used to pay the USPS employees, the vehicles they use. When we are buying a semipostal stamp we are also contributing our part to a just cause. There is no expiry date for these stamps and you can use them even after years of buying them. Of course if the postage prices rise, then you may have to pay for additional postage. That would not be applicable if you are using a forever stamp though. Commemorative stamps are often the dream of stamp collectors for it has a meaningful representation of a personality or an event. So if you are a stamp collector, then these postage stamps are definitely the ones you need. USPS offers an unrelenting postal service that has not diminished even a little despite the global digitalization and increased use of electronic communication. An agency which is independent of the federal government of USA, the USPS (short for United States Postal Service) provides delivery service to every address under the US federal government. And when we say every address we are speaking about more than 150 million residences, corporate organizations and of course the post offices. USPS employs more than half a million people in its service and the daily volume is stated to be around 160 billion. As a self supporting agency they generate revenue of nearly $67 billion every year. They have nearly 30000 retail locations and their website is among the top most visited ones of the federal government. The service itself does not receive any tax dollars for their expenses and to cover their costs. They rely completely on the products, services and of course the sale of postage stamps to customers. The US Postal service strives to provide a reliable and a secure way of communication at an affordable cost covering every state of USA, and also covering the military installations of the country and its territories. The USPS covers more area than any other postal service in the world geographically. The USPS has been in existence for nearly 250 years now and continues to be the most trusted communication partner for the country. It continues to be the strong foothold for the growing economy connecting people across remote locations. The first of the US postage stamps was issued in the year 1847 much later than the time the first postal service began. The postage stamps are issued by USPS and the revenue generated on the sale goes to cover the operating expenses of the US postal services. Of course if you are getting a semipostal stamp then part of it goes to the cause it represents as well. There are many different postage stamps that you can get depending on the need. The first class postage stamp costs you the same amount and will cover any first class mail, despite when the stamp was bought or if there has been any increase in the postage prices till date. Anyone can use the first class postage stamp and send letters or light weight packages to anywhere. There are four different types of postage stamps that you can get depending on what you need them for. With no expiry date, these stamps are for forever. From the time of their first issuance in 1847, the postage stamps have come a long way in serving as an image of USA. Despite the increase in digital communication, postage stamps still manage to serve the community and bring people together. They are not just evidence of the fact that you have paid the postage, but they also have historical importance in revolutionizing the postal system. The postage stamps of US, are a way to depict and highlight important events and marking milestones in the history of the nation. Stamps.com is one of the leading premier service providers online that offer you the chance to print out US postage stamps at your leisure. All you need is a computer which is connected to a good printer and a robust internet connection to print out as many stamps as you want from anywhere. Stamps.com has nearly 736000 subscribers and it is also the first company to be approved by the USPS for printing postage stamps from online. Most of the subscribers to Stamps.com are home office owners, online sellers, warehouse shippers and small startups. They have partnered with Microsoft, Avery, HP and of course the USPS to provide unrelenting postage services to its consumers. Thanks to the services offered by Stamps.com, now the business owners do not have to step into the post office to get their stamps. This saves you the time to wait in line at the post office to get a secured postage. Most importantly the solution is completely reliable and highly secure. The postage meter at Stamps.com is nearly 50% less than that of other options including the conventional meter, which means you are looking at a major cost save. Moreover the postage meter allows you to track and report any expense with ease. Photo stamps are yet another interesting product with Stamps.com where you can have a personalized stamp with your favorite photo printed onto your postage meter. There are also options to choose from a whole range of photo stamps based on the occasion too. There are quite a few features to Stamps.com that makes it the ultimate destination for all your stamps related needs. Options to print out in bulk which is a boon to those who are looking to get shipping labels to send out their products in bulk. The site does not just give you the chance to print your shipping label and stamps but it also give you the choice to print the addresses as well on your envelopes along with the postage. This saves you both effort and time. You have the option to create a return label on your shipping if you want to give the option to your customers to return any product at any time. The chance to send notifications to your customers when the order is shipped, and the ability to track your purchases makes it more customer friendly to you and your consumers. When it comes to home offices and startups Stamps.com is definitely a gift wrapped to perfection. There are few factors that work highly in favor for those who want to use Stamps.com for their mailing and shipping solutions. The price of subscription which is at $15.99 for a month is very low in comparison to many other shipping solutions. For those who have to ship more than 50 orders in a month this works out highly favorable. You don’t have to know the technical jargons or be an expert to make use of the website. It can be easily understood and you can easily search answers for any of your queries. The cost of the stamps does not vary between places and you cannot always expect the USPS to be open and they deliver by post. With multiple places to choose from, you can select at your convenience. Of course, the best is to subscribe at Stamps.com where you can buy and print your stamps at any time of day or night and on any day as well. You would find that Walmart has a presence in almost every city and town in United States. And what is more important is that they are open on all days and at all times. Additionally, this is one place where you can get not only postage stamps but also other post related stationery like envelope, writing paper, etc. As you step into Walmart, you would actually be buying your entire postal requirements in one place. The stamps are usually placed at the cash register and in case you do not find them there, you can check at the customer service desk. The pricing of the stamps will depend on the quantity that you are buying and also on the type you want to get. There are also ATM dispensers in certain Walmart stores that also deliver postage stamps. You can choose from a large variety of postage stamps at Walmart. You can also get them at the Wallgreen stores near you. If you don’t have the time to go to a store or to the USPS, then you can buy your postage stamps online. Amazon, an online retailer well known for its wide variety of products, also sells US postage stamps to those who would like to have them. Amazon has all the type of stamps available at varying quantities and in varying images. Shopping for postage stamps on Amazon is quite similar to any other purchase you make in Amazon. You can simply search for these at the online store and get them added to your cart as much as you wish. You can use the multiple payment options in Amazon to pay for it. You can even use your Amazon pay balance to pay for the postage stamps. If you are a collector looking for some specific stamp at a desirable rate then Amazon will definitely give it to you. eBay is the most used online site for buying and selling, especially auctioning. If you are a stamp collector, then you would do much well if you keep tabs on the bids in eBay. There are really rare collectors’ items that pop up from time to time at a price that is unimaginably low. On eBay, you would even find a complete collectors’ album up for sale if you are lucky. What makes buying on eBay more interesting is that you can buy even the rarest of the stamps on sale here. In order to buy stamps, just simply key in the search term in the website and you will be loaded with the multiple results pertaining to it. If it is an auction of course, you have to bid on it and then go through the process of getting the sale in your favor. It is often the prerogative of a person to save time and money wherever he/she can. And if you are looking to pay a visit to your bank then buying your postage stamps there will save you the ride to post office. Now we all know that banks sell postage stamps but remember that not all banks do so. You may want to check the website of the banks or the website of USPS to know the ones that do. You have to, however, factor in the working hours of the bank when buying stamps from banks. But if you are looking to get the postage stamp from ATM then you wouldn’t have to worry about working hours either. The only downside to buying stamps from a bank is that you are limited to the number of working hours they operate in. Also the fact that not many banks offer has to be considered. Apart from Amazon, eBay and of course the USPS website, there are also other online retailers who sell postage stamps on their site. The process of buying is quite similar to how you proceed in sites like Amazon or eBay, where you choose the stamp as a product to buy and proceed to check out. Before making an order you need to determine the exact postage amount that you want and also the class (domestic or international) for your mail. To know the postage amount you need to know the type of mail piece, the weight, the destination, etc. Once you have calculated the amount of postage, you can easily choose the number of stamps or the type of stamp that you need and add them to cart. Some of the websites like Stamps.com will allow you to print them on your printer while some would send it on post to you. Grocery stores offer a convenient place to get your postage stamps without much hassle. The fact that there are quite a few grocery store chains all over the country, it makes it easy for you to get postage stamps from anywhere. The stores generally have them in booklets where you can get them in sets of 20. If you are going to visit the store only for the stamps, you can actually call them to know if it is available before dropping in. But if you are already there for your monthly grocery shopping then you might as well combine your stamps shopping with it. These would generally be in the section selling stationeries or at the customer service desk or at the cash register. You can pick them up and bill them like any other item on the grocery store, paying them with your card or store credit or other options. If you are looking at a place that is open at all hours of the day and are available every few miles, then gas stations are your best choice. But again the flipside is that not many gas stations sell stamps, so you may want to know which ones do and which ones do not before paying a visit. It is definitely worth asking if you are already there filling up gas for your vehicle saving you from a trip to another location for postage stamps. The purchase of postage stamps at gas stations happen the same way you purchase anything else. You can choose what you want and the quantity and pay for it along with your other purchases including gas using your card or cash or other options if any. With the gas stations open to you at any time of day and night, they are the best places to get your postage stamps at the ready. The ATMs provide you with an easy and more convenient way to get postage stamps. Of course not all ATMs sell postage stamps and you will need to find one that does by visiting the USPS online site or the bank website. When you are buying postage stamps from an ATM you can directly pay from your checking or savings account. The steps to buy might slightly vary between banks, but generally you have to first input your card into the slot and enter the pin number. Choose the account that you want to be charged after selecting the option to buy stamps. There might be a fee involved which the ATM will inform you prior to the purchase. You can confirm if you are fine with the charges and then the ATM will dispense the stamps that you had requested right away. Telco stores which offer networking and telecom solutions are also one of the leading sellers of postage stamps outside USPS. The process of buying these at Telco works in a similar way like any other big stores like Walmart. You would generally find them at the cash register and if not you can always check at the customer service desk and they will help you. Paying for your postage stamps at Telco will also follow the same routine as paying for any other product or service you buy at the store. You could use any of your usual payment options to pay for the postage stamps as well. In order to buy the stamps from USPS, you can simply visit their offices and get the postage amount paid for the necessary stamp. The other option is however to visit their online store. The online website https://store.usps.com/ will have multiple products and services listed under different categories. You can either click on the option marked as “Order stamps and supplies” under Mail & Ship or simply “Stamps” under Postal store. There will be further classification on the category of stamps, format, and year of issue (mostly suited for the collectors), shape and quantity of the stamps. You can even choose the color that you want to use, theme, price range and of course the mail service that you want to avail. You have to however register with the site before you start making your purchase. Once done, you can choose the stamps you want to buy and proceed to checkout like in any other online website. The stamps will be mailed to you on confirmation of payment. Buying postage stamps online offers you the freedom and convenience to make the purchase at your leisure. You have the option to choose from a wide array of choices and opt for one that will best suit the occasion and the mailing. First you need to weigh the letter or the package that you want to be sent. The weight of the package will decide on the postage that you have to pay. Once you have the weight, the next is to know the destination. We all know that USPS delivers not just within the United States but also to international destinations. The destination will decide on the postage stamp that you need. You have to then choose whether you want a first class mail or a semi postal stamp or a theme based stamp for your post. Depending on what you need you can then choose the stamps from the collection online. After choosing the requisite stamps, you can proceed to checkout where you can pay with the options as available at the online site. You also have options to print the stamps at your home, when you are using the website Stamps.com, which eliminates the time spent on waiting for the stamps to be delivered via mail. Despite the digitalization of the world and the increasing popularity of digital communication, postal services continue to be the leading communication channel in United States. With the options of mailing and shipping solutions now available online with the postage stamps, you can now utilize them effectively. It was in the year 2007, when the forever stamps were first issued by the United States Postal Service (USPS). There is no denomination associated with these postage stamps and they are of the first class. So you can use them to mail your first class letters, no matter the postage price of that time. The forever stamps continue to give the same value despite the fluctuations in postal rates. For instance, if you had bought a forever stamp couple of years back for say $0.46 and the current postal rate is $0.50, it will not matter. You can still use the same forever stamp to mail your letter. The forever stamps can be used to mail one ounce letters or normal sized letters anywhere within the country. It is therefore important that you are sure your letter doesn’t weigh more than one ounce when using a forever stamp. In case of heavier mail, you have to include more postage to cover the weight else the mail will be returned undelivered to you by USPS. If you have a two ounce letter then placing two forever stamps might actually cover the postage. However the cost of two forever stamps is higher than a simple additional postage for the extra ounce. You can use any of the below services to send letters with USPS. Priority mail if you are in a hurry to send your package across and it can weigh up to 70lbs. The mail ships in 2-3 business days depending on the destination. First class mail is the standard service offered for single envelopes that do not weigh more than 3.5oz or packages which weigh up to 13oz. This is the most affordable service for mailing in USPS. The mail will be sent in 1-3 days. Priority mail express is the best suited for the time sensitive document mailing for it works on all 7 days. It comes with an overnight guarantee. A postcard is similar to a mail but it goes without an envelope. It is best suited when you are sending a card from your holiday location to your friends and family letting them know where you are. Post cards also offer an affordable way for businesses to market their products. It is also among the most affordable way to communicate, especially with USPS where the cost is only $0.35 which is comparatively less than the affordable first class mail of $0.50. Post cards should not be folded and sometimes they carry the image of the company they are being sent from. If you are looking for an affordable way to send media related materials through post then Media mail is your best solution. You can send videotapes, books, CDs, DVDs and any other printed disc or sound recordings through this option. The only constraint is that it should be less than 70lbs in weight. The cost may not be quite high in sending these mails to your respective recipients but the time taken for delivery will vary anywhere from 2-10 days depending on the location. USPS does a double check on the package sent through media mail by opening them to ensure there is no misuse. If you want to get a proof of receipt of your mail, then you should use the certified mail service of USPS. The mail uses a tracking wherein the sender is informed when the delivery is made and also for every attempt is made to deliver the mail. A receipt is delivered to the sender when the mail is received by the intended recipient. If you choose for a return receipt on mail then it would cost approximately $6.70 while electronic confirmation of delivery will cost $4.72. For extra charges, you can also get electronic signature of the receipt sent to you for verification. While this might be the least expensive, it is also the slowest of the delivery services offered by USPS. This is best suited for packages that are sent through USPS in a specific time frame. The mail is also referred to as Standard post and parcel post. It takes typically anywhere between 2-9 days for the retail ground package to reach the intended recipient. However depending on destinations it can even take 14 days for the package to be delivered. The cost of the shipping will depend on the weight of the package, the distance to the destination, and the dimension of the mail piece. The library mail at USPS offers an affordable solution to the museums, schools, universities, colleges, libraries, etc. to send across their books and other items to another one of similar kind. The items can weigh up to 70lbs and it can contain academic thesis, books, recordings of lectures, or any other media that is related to the field. For the first pound you would be paying about $2.53 and for every pound added, there will be an extra charge of $.48 per pound. One cannot send advertising materials or other non library items in this option. It might take 7-10 days for the package to be delivered depending on the location. Stamps are generally printed over a customized paper showing value and its denomination. The stamps are sold in a variety of formats in USPS and the other outlets, both online and offline. This is the most common format you would find the stamps in where they are neatly arranged on impressed paper. The size and format of the stamp will decide on the number of stamps per sheet and the format of the sheet as well. Smaller stamps would be available in sheets of 100 whereas larger ones will be in the count of 20, 25 or 50 depending on the size of the stamp. There are also souvenir sheets where there could only be one stamp or more depending on the event or the person it is commemorating. The book of stamps will have about 20 stamps and the cost will depend on the stamp that you are buying. If you are getting a book of stamps for the first class mail then at a cost of $0.49 per stamp, the book will cost you about $9.80. It is more useful to small businesses and entrepreneurs who are looking to send mailers in bulk. Getting a book will ensure that you have the stamps readily available with you whenever you need them. You get book of stamps for all different stamp types and from every USPS outlet as well. Four or more un-separated stamps are referred to as blocks. They are revered with more importance because it is quite rare to find them. They keep the position of the stamps at the time of printing intact which also raises their significance. The cost of the block will again be dependent on the individual stamps in the block. The block will have similar stamps and the cost of each stamp will add up to the total cost of the block. You can get them at your nearby post office and sometimes at the other USPS outlets as well. A roll or coil of postage stamps will have about 100 stamps in them. The size and the design will vary based on the option you choose. The cost of the roll will again depend on the cost of the stamp in it. If the stamp cost is about $.49 then the roll will cost you the same for the 100 stamps in it. You can even get specific design or specific theme postage stamps on a roll or coil from USPS. You can get different type of stamps from forever stamps to simple first class mail stamps in roll and coil. Single stamp is nothing but an individual stamp that you can get anywhere from USPS offices to supermarket stores and also online. Normally most of the individual stamps that people buy will be from the forever category for the purpose of collection, same is the case for the commemorating stamps as well. The cost of the stamp will vary based on the current postage rates and it will again vary between based on the kind of stamp that you buy. Single stamps are generally sold at post office as most of the other outlets will sell them in bulk. Strip of stamps are quite similar to the roll or coil of stamps and it generally is about the width of one stamp. Placed in a singular column, you can get these strips in any stamp format you want from the USPS offices. The cost of the strip will be based on the cost of the stamp and the number of stamps in the strip. Sometimes the strip follows a theme, like nature, where each stamp depicts different images but it will be priced at the same cost. The postage stamps by USPS are generally issued in four different shapes. Vertical Shape Stamps: These are generally stamps that look like a standing rectangle with the breadth on top and bottom and the length along the sides. You will get all kind of stamps from forever, commemorative and first mail stamps in this shape. These are mostly used when representing a personality for it gives a better outlook. Horizontal Shape Stamps: These are your typical rectangular stamps featuring multiple images depending on the time of their release. These will again have many forever and commemorative stamps featuring a specific event and sometimes even a personality. They are mostly used in cases of colorful images for the shape brings out the essence quite clearly. Square Shape Stamps: This is one shape that you will find in every format, from forever to semi postal, from priority mail to first class mail. From featuring simple natural objects to famous personality, these are available in multiple price ranges. Circle Shape Stamps: Most of the international postage stamps come in the shape of a circle. It is best suited when the object to be printed is circular in shape rendering more importance to the image. For instance the Baseball forever stamp or the Moon international stamp does quite well in the circular shape. While these 4 are the major shapes of stamps you would find with USPS, there are also other shapes that you can get for your postage stamps. There are stamps in the shape of geometrical figures like octagons, triangles, rhombuses and also in free form like heart shape. In fact the country Tonga even released a stamp in the shape of a banana. USA has the record for using the biggest postage stamp ever in the year 1865 when mailing newspapers. The stamp measured 52x95mm. Stamps are generally issued in sheets, at least until the year of 1890. The printing of the stamps have changed since then with the stamp dispensing machines coming into existence. And thus changed the way the postage stamps were issued. You can now buy stamps in the form of booklets or sheets or coils. There are even stationeries like cards and envelopes with pre-printed stamps on them. As per the standards followed by USPS, a single sheet of stamps will contain 50 individual stamps. There are also smaller sheets which might contain lesser quantities. Any individual stamp from a sheet is referred to as the single and it will cost the same as a single postage stamp cost. The corner block of 4 stamps separated by the perforation is referred to as the block of stamps. In case of coil of stamps, the issuance is dependent on the need of the individual. Individual stamps printed on a single column are rolled into a coil with a perforation to separate them. In a typical stamp dispensing scenario, the roll or the coil of stamps is used as much as the stamps that the person needs. In case of a booklet of stamps you will find anywhere from 10-20 stamps and they are bound with a colorful cardboard and covered to keep them safe from any harm. While a sheet, coil or a block will have varying quantities of stamps, you can always get the quantity that you need from USPS or any other outlets depending on your need. There are a variety of themes in which the postage stamps are issued. The themes identify themselves with a specific emotion like love, or a specific holiday like New Year or simply a holiday based theme. The postage stamps stand beyond the usual duty of being the postage evidence and convey a deeper meaning along with the letter they take with them. Here are some themes that you will find commonly used across the USPS postage stamps. The most popular of the lot is the love themed postage stamps. So if you are looking to convey a message or send a letter to your loved ones, then affixing it on a stamp will only enhance the emotion. From simple flowers to floral writing of the word “love” the postage stamps are designed to make it romantic. You are getting married and you want to mail the invitations to your near and dear ones. We are sure you would have picked up great cards to mail them. Make the cards extra special with the wedding themed postage stamps affixed on them. Nature is probably the most enjoyed feature in the entire world and by everyone. If you want to make the world of nature part of your mails, then you can use a nature themed postage stamp as part of it. There are quite a few commemorative postage stamps in the honor of many events from baseball to many personalities. Celebrate the event and the personalities whom you like by sending a postage stamp in their image. Historical events tell us more about our roots than any other evidence. Make history with the historical postage stamps on your mails and let everyone know more about their roots. Looking to add a personalized touch to your mails with the famous personalities like Oscar de La Ranta or John Kennedy? Do so with the people themed postage stamps from USPS. Holiday seasons are always in abundance and when you want to wish someone the best in their holidays, make sure to include a holiday postage stamp to stress on the importance of your wishes. Sports are an integral part of our everyday lives and it is definitely not surprising to see sports based postage stamps available to please your inner sportsman. Apart from the abovementioned, there are also music icons, Disney themed, Hollywood themed, seasonal themes appearing on postage stamps from time to time. The cost of the postage stamps go under revision once in a while and this will depend on the cost of the operations run in the USPS of course. The cost will of course vary based on the kind of stamp that you use. The rate of the stamps will depend on the cost of postage, which is again revised based on multiple factors. Recently in January 2018 USPS announced a price hike in postage rates which has directly affected the cost of the postage stamps. For any first class mail stamp you would need to get $.50 postage stamp. In case you do have a lesser postage stamp then you will need to buy an extra ounce to compensate for the addition. Of course if you are using a forever stamp then you don’t have to worry about the postage hike as far as the weight of the mail doesn’t exceed the limits. While the cost of the postage stamp will depend on the weight of the postage or package itself, you will find that the first class mail stamps are automatically aligned with the cost of the postage for a one ounce first class mail. The metered mail using postage meters from online is also set at $.47 with every additional ounce costing $.21. There is an expected increase of 3.9% on international shipping across priority mail, priority mail express and first class packages which mean you will be paying $1.15 on any letter to any international destination. The domestic shipping across the first class packages, priority mail and priority mail express will also see an increase of 3.9%. While the forever stamps do not expire and have the same value as any other forever stamp of today, any new purchases will see an increase in value of the stamps. USPS came into force for more than a two century ago in the year 1775, when Benjamin Franklin was appointed as first Postmaster General of the esteemed postal service of America. Ever since then the postal service has endeavored to deliver unfathomable services to the growing population of America. The postal services have embraced the changing and advanced technology to provide fast pace and on time service to its customers. The history of the postal service reveals the truth about the American postal service how it has reinforced the national economic system and has helped to disseminate useful information to the public. The postage stamp has played a significant role in the history of postal services. Initially, the American postal services were delivering the stamp-less posts or letters. But the drawback was the cost has to be borne by the receiver. Later pre-payment letters were also introduced but the adhesive postage stamps with nationality mark were the most successful postal prepayment universal system proved to date. The adhesive postage stamp was first issued by the US government for the post office in the year, 1847. The postage stamps were issued in the denominations of five and ten cents and by 1855 it was mandatory to use the postal stamps for sending posts or letters. Later in 1890, postage stamps confronted a revolutionary change. The post office personnel’s realize that the revenue could be generated by selling stamps as “collectibles” to the customers. Thus, commemorative stamps were issued with national exposition. The postal services have witnessed many technological changes, which has directly affected postage stamps. The technological advancement has provided improved and updated service to the customers. The clerks no longer use the adhesive stamps, it is now replaced by (PVI) postal value indicator which isa computer label used instead of stamps. It was nearly 175 years ago, when the first adhesive postage stamp came into being. It was on 6th of May 1840, when Penny Black was first introduced. Stamp collector initially referred to those who were in charge of collecting the stamp duties. Later on the term was used to refer to those who collect stamps as a hobby. Of course Philatelist is another word that refers to the same. Despite being a big hit on TV, the Simpsons did not make a good hit on the stamps. There were nearly 682 million commemorative stamps bearing the Simpsons character was printed of which only 318 million were sold, owing to a price hike in postage. Nevertheless they are among the top 30 best sellers of all time. In order for a personality to be featured in a commemorative stamp, after their death, there is a customary waiting period of 10 years. The rule is relaxed only for the President of United States. For every dead president, the stamps are released on the first birthday after their death. Before 1883, the back of the postage stamps was used for marketing. You would find advertising of various products printed on the back of US postage stamps. The astronauts of Apollo 11 took a die for casting stamp on their way to moon. They pulled an impression on it as they landed making it the first stamp to be released in moon. The die upon return was then used to make airmail stamps of 10 cents in September of the year 1969. The largest post office in the world is located in Chicago, Illinois and the smallest post office is in Ochopee, Florida. UK is the only country whose name doesn’t appear on its stamps. It is allowed by the universal postal union because Britain was the first country to issue stamps. 1. How many types of postal stamps are available with USPS? Airmail Stamp – The airmail stamps depicts the picture of an airplane or of a popular pilot. The airmail stamp is used for sending special postal mails via airplane, unlike train and ship mails. Computer Vended postage – The advanced technology IBI (information based indicia) uses the 2D barcode to encode details. Definitive Stamp – Such stamps are used for day to day postage services. Commemorative Stamps – Such stamps are dedicated to display commemorate of a person, event, or an anniversary. Historical events are also depicted on such stamps to pay homage. Local post stamp – These stamps are used for local postal services limited to the local geographical area. Non-denominated postage, Overprint, Perforated stamp, Personalized stamp, Self –adhesive stamps and many more. 2. How to make stamp selection out of varied options? Choosing stamp as per your usage and choice is very easy. Just login to USPS website and select the option stamps under postal store option. It will redirect you to the page where you can make your selection and order online. The postage stamps are further divided into various categories such as Product type, Format, Issue year, Stamp shape, Quantity, Color, Theme, Price, and Mail services. 3. How to purchase stamp online? It’s quite simple and easy. First, register yourself with USPS by creating an account. Once you are registered you can make your stamp selections as per your preference. Suppose you are sending mail to someone special and to make him/her feel special, make a selection from the featured stamp. After that choose a format, choose a quantity of stamps required, and finally add all to the cart. The total amount of the stamps will be displayed on the same page. Once you have added all your purchases to the cart simply checkout and make payment. 4. What are featured stamps? Featured stamps are designed to commemorate a person or an occasion, it also depicts historical events. Featured stamps could be defined as expression cards as well. Few of the popularly featured stamps are Mister Rogers, Lena Horne, Love flourishes, The history of Hockey, Bioluminescent life etc. 5. What is stamp subscription? Stamp subscription is a postcard roll of 100 postcard stamps. The delivery frequency of stamp subscription is monthly or bi-monthly. The payments could be done via credit card on a monthly or bi-monthly basis. The advantage of stamp subscription is that the purchaser gets 100 postcard roll monthly or bi-monthly for the selected period of time as opted i.e., for 6 months or for a year. The subscription gets debited from your credit card automatically once the stamp card roll is delivered. All the order prices are exclusive of shipping charges which will be added as per distance. Stamp subscription also features first-class roll. The prices may vary kindly refer the website to know accurate shipping rate and product specification. 6. What are the current postage stamp rates? The USPS determines the rate of the parcel by considering factors such as weight, mail class (priority or first class etc. ), and shape. Discounted rates are also available when purchases are made online, to know more visit the website Stamps.com. According to the rate of the parcel or letter, postage stamps will be required. There are various factors which affect the rate. Various mailing categories are – First class mail letter, Postcard, First class mail international letter, First class package service, Priority mail, Media mail etc. While purchasing various categories of postage stamp the rates are mentioned along with the stamps. The stamps are categorized under separate section thus making the purchasing easier. Stamp products include featured stamps, forever 50-cents, over 50-cents, under 50-cents, semi-postal, and stamp subscriptions. Various collections and formats of the postage stamp do affect the pricing. Whether its featured stamp or postages the rate varies accordingly. Even popular themes postage stamps are quoted higher than normal postage stamps. During Valentine’s Day, the featured love stamps were issued thus making the stamp selection more personalized. Another example is Sleeping Bear Dunes stamp which is a Priority mail express stamp. It was issued to express homage to the sleeping bear dunes of National Lakeshore. Once the buyer chooses the format, the total price will be displayed. Hence, the USPS stamp collections have various options for the customers to match their requirements and budget. Where to Buy Stamps Copyright © 2019.